After 15 years of stop-and-start efforts, Concrete locks down final funding for its planned Fire and Life Safety Building: a $1 million Community Development Block Grant. 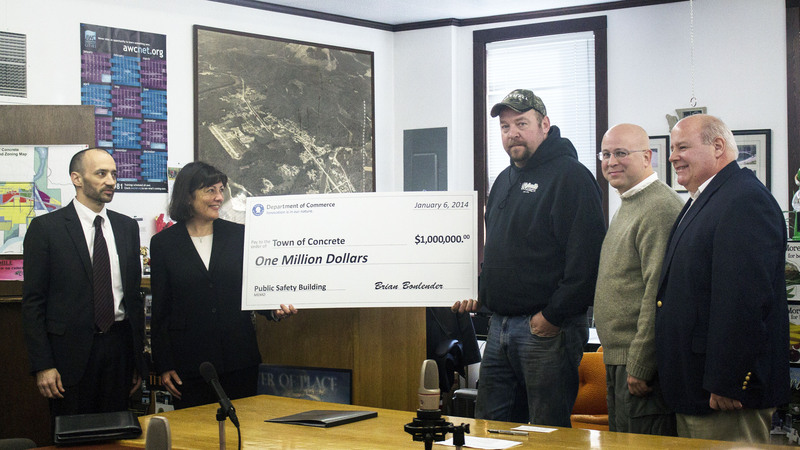 The second and final piece of funding for Town of Concrete’s planned Fire and Life Safety Building fell into place on Dec. 31, 2013. Word came from State Senator Kirk Pearson and U.S. Rep. Suzan DelBene that the town had secured $1 million in Community Development Block Grant (CDBG) funds toward construction of the much-needed building. 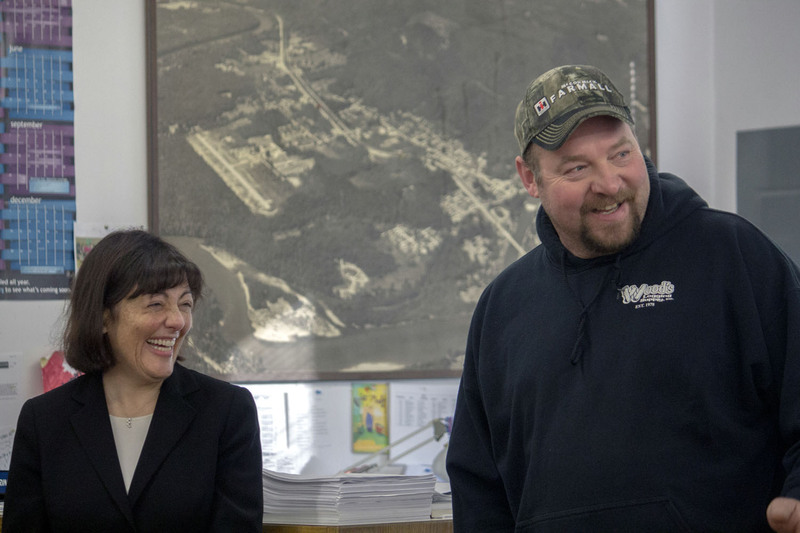 On Jan. 6, Pearson and DelBene arrived at Concrete Town Hall with Washington State Dept. of Commerce Director Brian Bonlender to deliver a novelty check for the full amount, and congratulate the town on the completion of a crucial milestone. The CDBG money will be combined with a $785,000 State Capital Budget appropriation that Pearson had pushed for during 2013. The combined funds will fully finance the new building. Concrete’s current fire hall is about 100 years old and deteriorating rapidly. Perched at the crest of a hill that drops down to the Baker River, its foundation is threatened by erosion that cannot be mitigated effectively because of Critical Areas regulations that govern the slope behind it. The building’s roof sags and needs to be propped up in multiple places, its tower leans, and the interior space simply isn’t big enough for modern firefighting equipment. The Fire and Life Safety Building was a priority for former Concrete Mayor Judd Wilson, who worked toward making it a reality during his term, which ended at the close of 2013. At Wilson’s suggestion, the town tapped Michelle Mazzola of Leavenworth-based Resource Solutions to write the CDBG grant application. The new Fire and Life Safety Building will be modeled after the McLean Road Fire Dept. Memorial Station on Memorial Highway west of Mount Vernon. That single-story structure has three large bays and includes two mezzanines inside, one of which could be finished off later to create offices. The building will be located on Main Street in Concrete, out of the flood inundation zone, between the Superior Building and the community garden, on what is now a stockpile for the town’s Public Works Department. The building will be placed on the site to accommodate possible future expansion of a fourth bay to the west and and a training facility along its east side. “Congratulations to the Town of Concrete, former Mayor Judd Wilson, current Mayor Jason Miller, council members, and all who worked so hard to bring this project to reality,” said Skagit County Commissioner Sharon Dillon, who works for District 3. Wilson pointed out earlier efforts by Congressman Rick Larsen, who visited Concrete on numerous occasions to discuss the existing fire hall and other projects in town before redistricting moved his efforts away from Concrete. “If it wasn’t for Larsen handing it off to Pearson instead of letting it die, I don’t think we’d have gotten anywhere,” said Wilson. The town will advertise for a contractor by the end of March, with construction planned to start in May, and completion by the end of November. Concrete’s planned Fire and Life Safety Building will be modeled after the McLean Road Fire Dept. Memorial Station on Memorial Hwy. west of Mount Vernon.